Okay, I just couldn't wait. I am jumping the gun. But, yes, I have ordered iris. First with Wild Iris Rows that opened early, and now with Blue J who opened today. Why buy now? I like Greg Hester at WIR so I ordered some classics I really wanted. And Blue J has my most wanted, lusted after, Bruneau Jasper and I wanted to get it before it sold out! So what did you order??? Wow, you really have started the New Year with a bang!!! You have some really nice ones! There must be some kind of title for the first order of the year...we'll have to think on that one!! Smith Named Keith is one that has intrigued me for awhile. I look forward to seeing pictures eventually! Yay Leslie -- one down, five or six hundred to go!!! Seriously -- what a glorious bunch of Irises! You're really starting the year out with a bang!! I ordered fourteen little guys and one BB this morning from Blue J. Setting a pattern for the year I guess. Thanks Mary Ann. You should have seen how many I didn't order off my list! Actually it was down to another 17 (gads!). Oh boy -- starting off with a bang!!! Oh Leslie -- that Iris is gorgeous!!!!!! Who sells it? 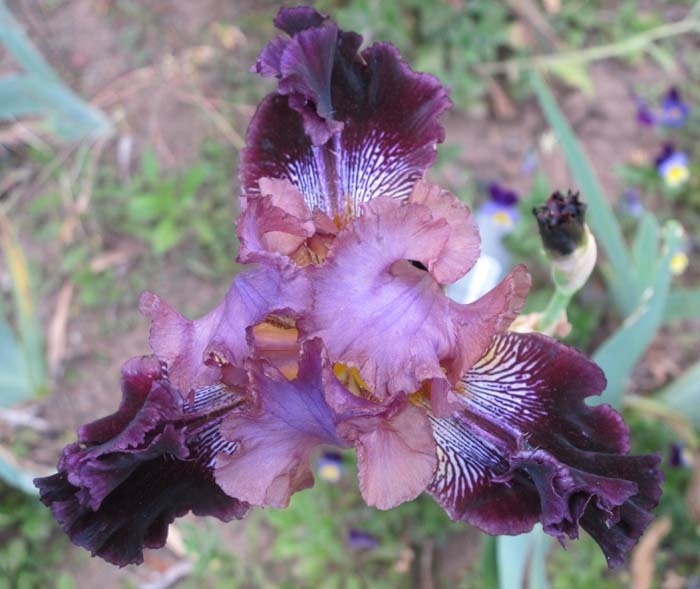 It is one of L. & K. Jedlicka's own (they are Blue J Iris). I usually wait until like April to make an order, but this year I jumped in with both feet. I placed an order with Superstition Iris Gardens for the following beauties! I tried to order "Zlatovlaska", but they no longer carry it. I am waiting for their catalog, but I expect to maybe double this order! Bonnie - yes, Stout's is hoping to have their new website up and running by tomorrow. There are some irises on the new website that aren't currently showing on the current website, so I can't wait to see what new goodies may be available!!! And for Quench fans, Hugh Stout said it will be on the new website (currently missing from the old website). Greg - You have some of my Must Haves! Broome Sunset, Microburst, & Arctic Burst! Really some nice choices there! I am sure the catalog will inspire more lovely buys. Ok...ok...you win. I'll go look at Blue J and Iris Sisters. Just so you know, I'm ready to blame what may happen on all of you. Here is my Superstition Iris garden "want" list; which means I should be choosing expanding my order from this list.